Nearing completion, this brand new striking contemporary designed executive home provides light and airy accommodation with rooms of generous proportion, easily facilitating the demands of modern day living. 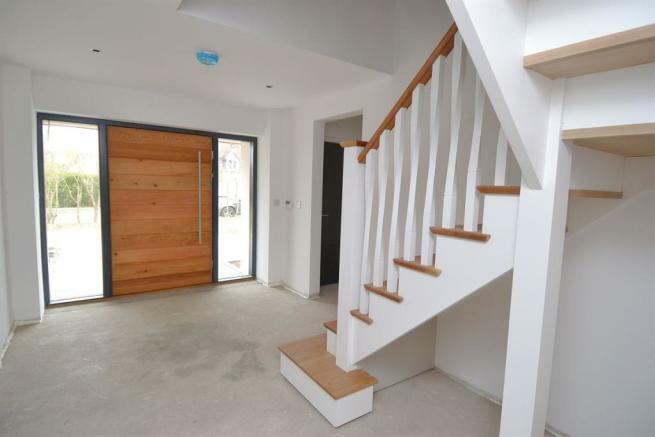 As you step inside you will be wowed with the immediate feel of space, with the large entrance hall giving access to all the rooms and balustrade staircase leading to galleried landing. The stunning open plan living space which spans the entire width of the property is definitely the hub of the home giving plenty of space for all the family and a great room for entertaining with two sets of bi-folding doors onto the 74ft x 56ft southerly facing rear garden. In addition, on the ground floor are two more reception rooms, two cloakrooms and utility room. To the first floor are five double bedrooms, two en-suites and a large family bathroom. Ample off road parking is provided to the front along with a double garage with remotely operated door. Conveniently located in the charming village of Chestfield with its 18 hole golf course and 14th Century barn converted to a Public House and restaurant. Bus services are available 175 yards in Chestfield Road to the quaint Harbour Town of Whitstable (approx. 2.1 miles) with its wide variety of individual shops and eateries and the Cathedral City of Canterbury (approx. 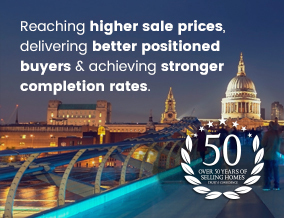 6.4 miles) with its extensive range of shopping, leisure and educational facilities. Local shopping facilities are available at Sainsbury's and Swalecliffe about 525 yards, along with mainline railway station and Chestfield Medical Centre. The desirable Tankerton with its delightful seafront and parade of shops, restaurants and cafes is about a mile away. 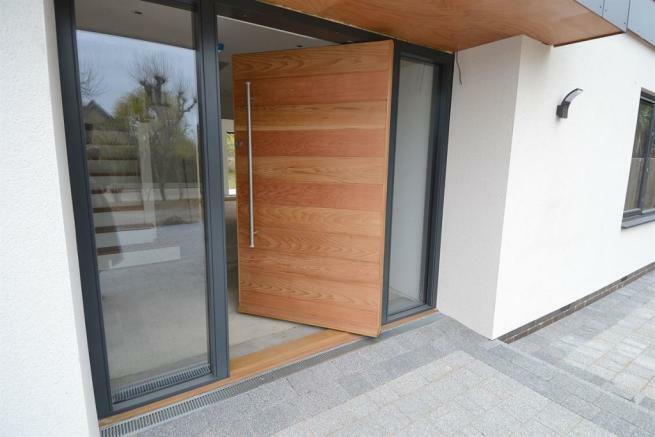 Large contemporary wood front entrance door with double glazed side panels. Cloaks cupboard. Thermostat control for underfloor heating. Engineered oak flooring. 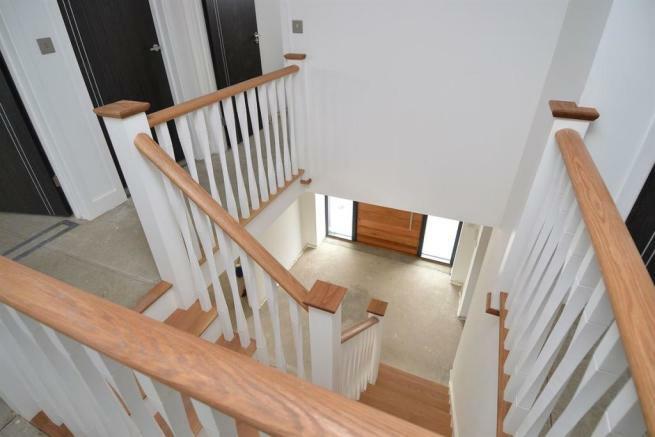 Balustrade staircase leading to semi galleried first floor landing. Suite in white comprising wash hand basin set into vanity unit with cupboard below and WC with concealed cistern. Underfloor heating. Extractor fan. Large window to front overlooking garden. Thermostat control for underfloor heating. TV point. Window to front overlooking garden. Thermostat control for underfloor heating. TV point. Phone point. Large island unit with Corian top, fitted cupboards and drawers below, feature butcher block breakfast bar area, undermounted stainless steel 1½ bowl sink unit, integrated dishwasher and inset induction hob with electrically operated pop up extractor cooker hood. Banked wall of fitted units incorporating built-in fan assisted electric oven, built-in microwave and two integrated fridge/freezers. Large window to rear. Bi-folding doors to rear garden. Thermostat control for underfloor heating. Downlighters. Pendant lighting over breakfast bar area . Porcelain tiled floor. Door to utility room. Bi-folding doors to rear garden. Window to side. Provision for wall lights. Thermostat control for underfloor heating. TV point. Phone point. Range of matching base units. Thermostat control for underfloor heating. Inset single drainer stainless steel sink unit. Work surfaces. Window to rear overlooking garden. Plumbing for washing machine. Space for tumble dryer. Wall mounted gas boiler supplying hot water and central heating. Door to rear garden. Porcelain tiled floor. Suite in white comprising wash hand basin set into vanity unit with cupboard below. Frosted window to rear. Underfloor heating. Porcelain tiled floor. Access to insulated loft. Airing cupboard housing lagged hot water cylinder and immersion heater. Window to rear overlooking garden. Floor to ceiling height fitted wardrobes with sliding doors. Radiator. Downlighters and pendant lighting. Provision for wall lights over bed. Door to en-suite. Suite in white comprising fully tiled double shower cubicle with multi-function body massage shower unit, wash hand basin set into vanity unit with cupboard below and WC with concealed cistern. Heated towel rail. Frosted window to rear. Downlighters. Extractor fan. Shaver point. Window to front overlooking garden. Provision for wall lights over bed. Radiator. Door to en-suite. Suite in white comprising fully tiled shower cubicle, wash hand basin set into vanity unit with cupboard below and WC with concealed cistern. Radiator. Frosted window to front. Extractor fan. Shaver point. 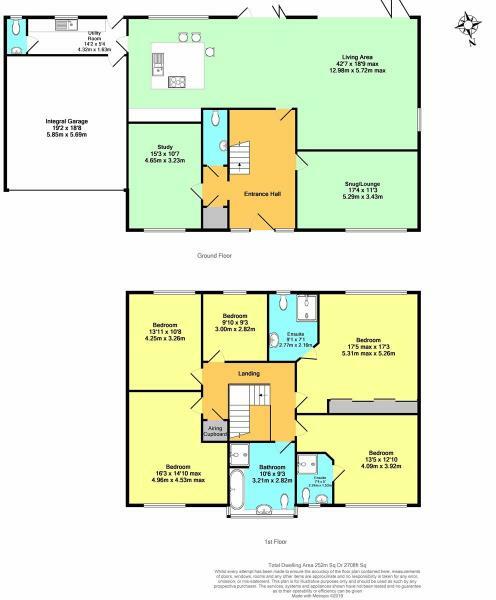 Suite in white comprising panelled bath with mixer tap, separate fully tiled shower cubicle, wall hung wash hand basin and WC with concealed cistern. Radiator. High level window to front. Downlighters. Extractor fan. Shaver point. Remote electrically operated up and over doors. Power and light. Sweeping driveway to garage and front of property providing extensive off road parking. Lawn and planting areas. To be laid to lawn. Natural limestone paved patio area with planter. Outside lighting. Gated pedestrian access to both sides. Enclosed with fencing. 10 year Build-Zone warranty. The property is fitted with a burglar alarm system. The following mains services are connected to the property electricity, water, gas and drainage. All services will be subject to the appropriate companies transfer conditions. Central heating is provided by a gas fired boiler situated in the utility room with underfloor heating to the ground floor and hot water radiators to the first floor as indicated in these particulars. 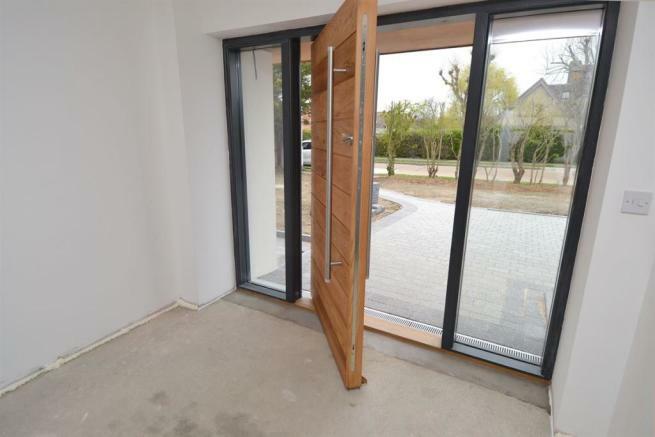 The windows are timber frames and double glazed sealed units and aluminium powder coated bi-folding doors. Disclaimer - Property reference 189020. The information displayed about this property comprises a property advertisement. Rightmove.co.uk makes no warranty as to the accuracy or completeness of the advertisement or any linked or associated information, and Rightmove has no control over the content. This property advertisement does not constitute property particulars. The information is provided and maintained by Kent Estate Agencies, Whitstable. Please contact the selling agent or developer directly to obtain any information which may be available under the terms of The Energy Performance of Buildings (Certificates and Inspections) (England and Wales) Regulations 2007 or the Home Report if in relation to a residential property in Scotland.